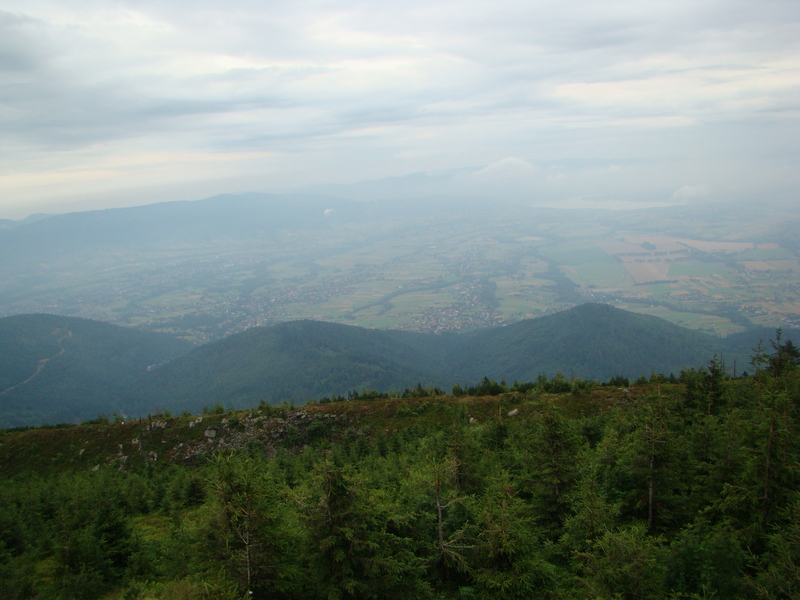 One Sunday we went to Ustron – small town in mountains, survives because of tourists. 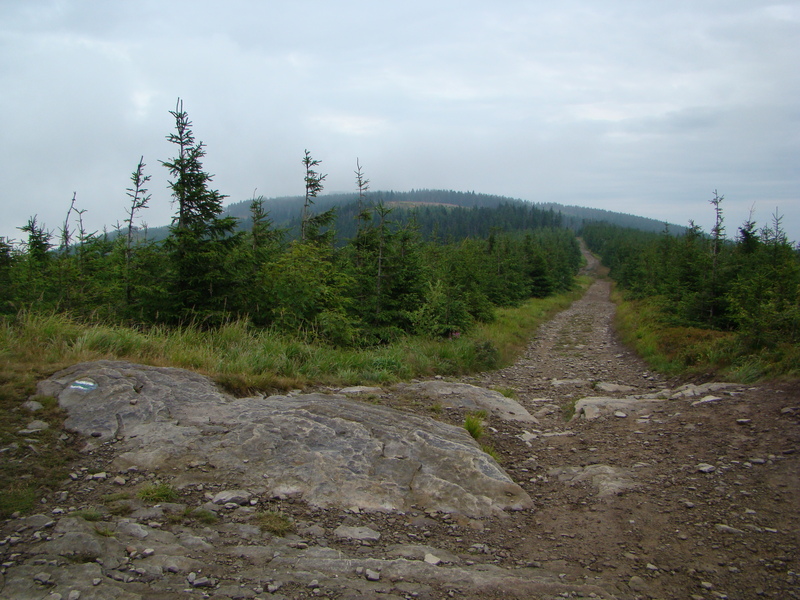 In summer – hiking. 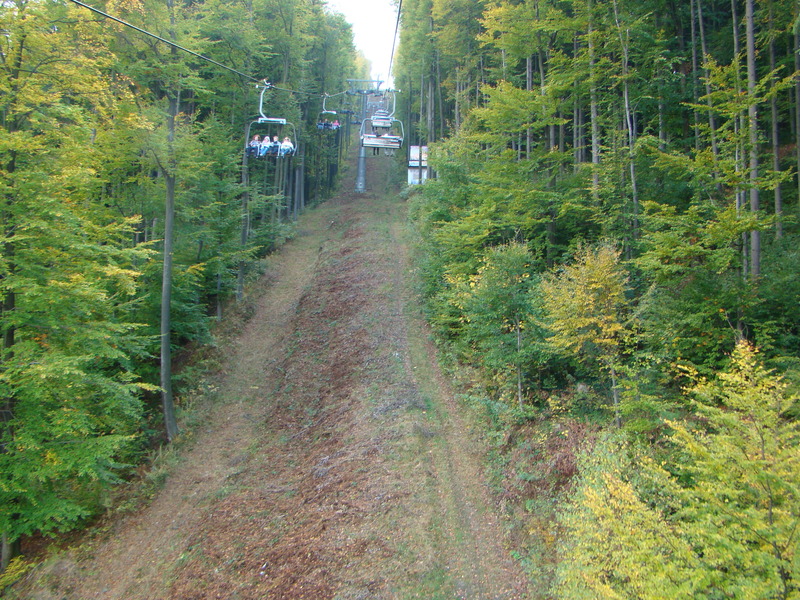 In winter – skiing. 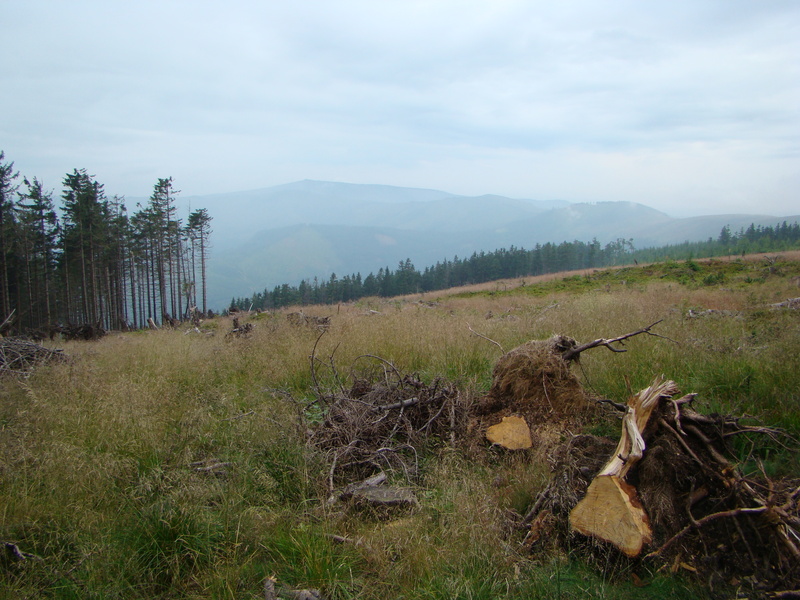 Ustron is not far away from Bielsko-Biala. 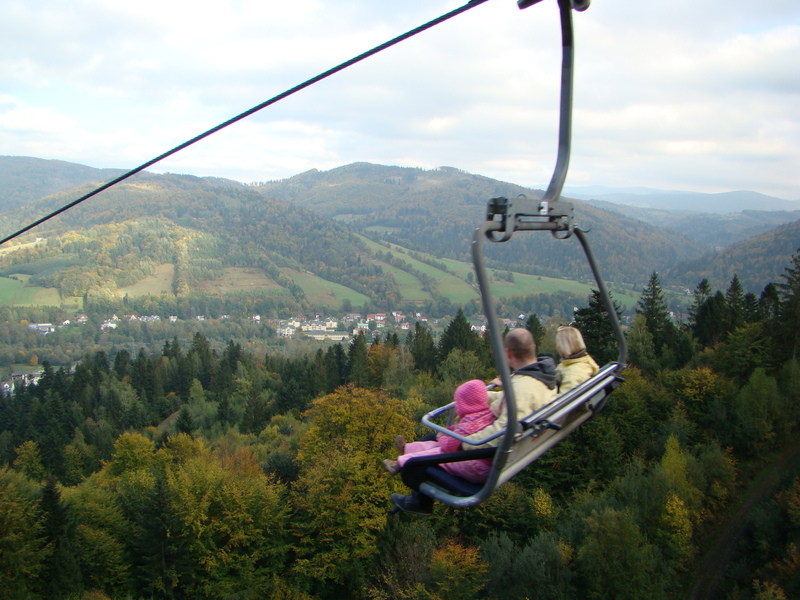 The biggest pleasure for me in mountains is to take chair-lift to the top, observe landscapes, feeling fresh breeze and swing legs. 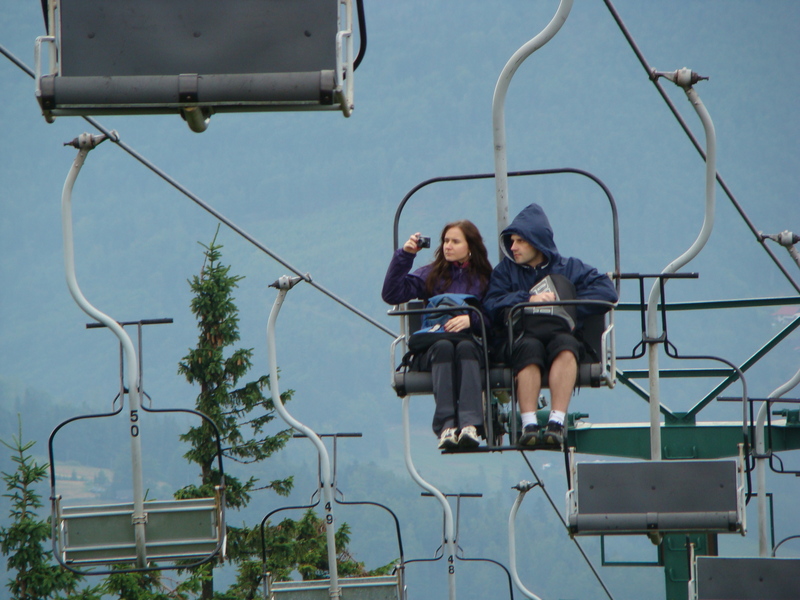 And we were lucky to get to local holiday -anniversary of chair-lift – and etrance ticket was for 1 PLN (0,25 EUR). A lot of families with children came. 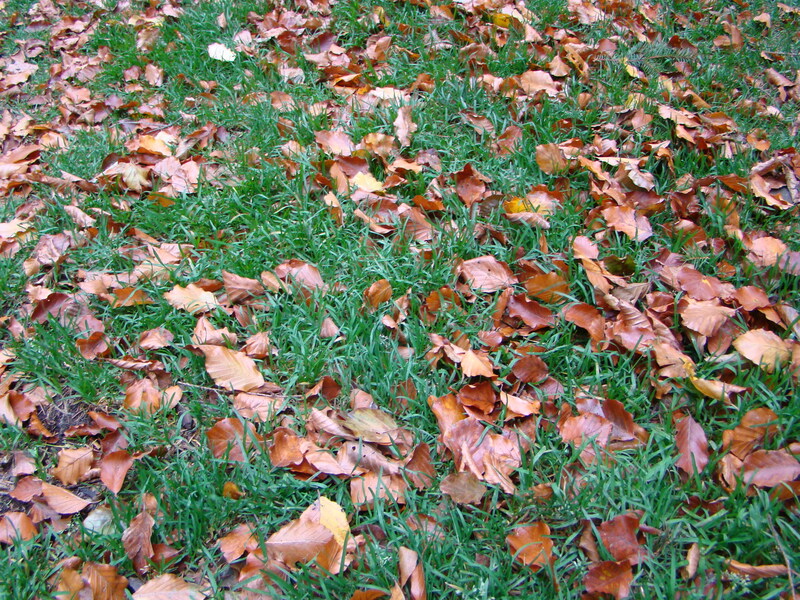 And we found ourself in beautiful autumn when leaves start to change color from green to yellow. 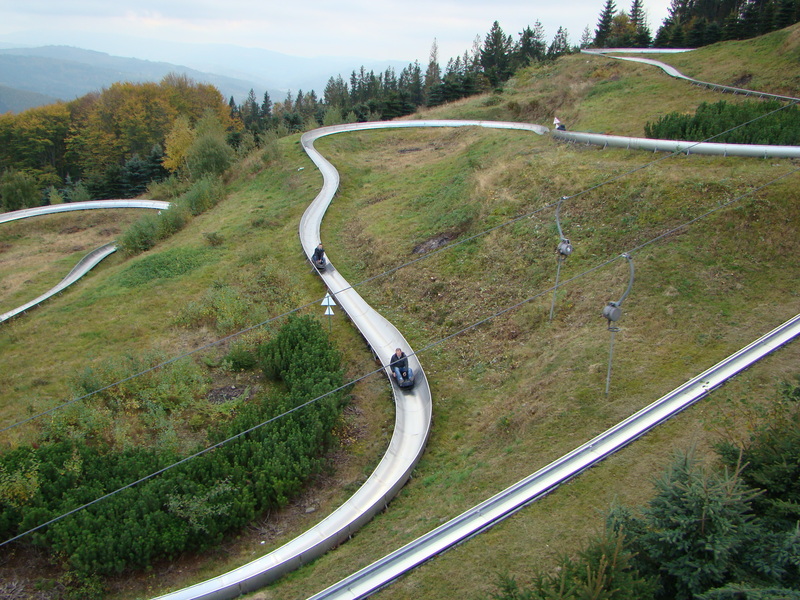 In top of mountain we found sledding way – quite popular attraction of winter ski resorts, but working at all seasons. We took trail and just walk enjoying good weather and diverse nature. 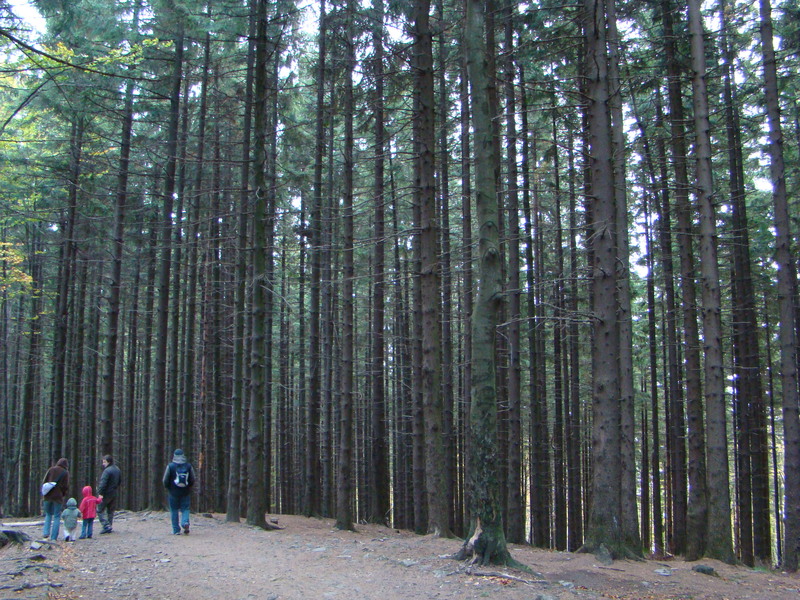 We walk, walk and walk in forest and found ourself in … Czech Republic! 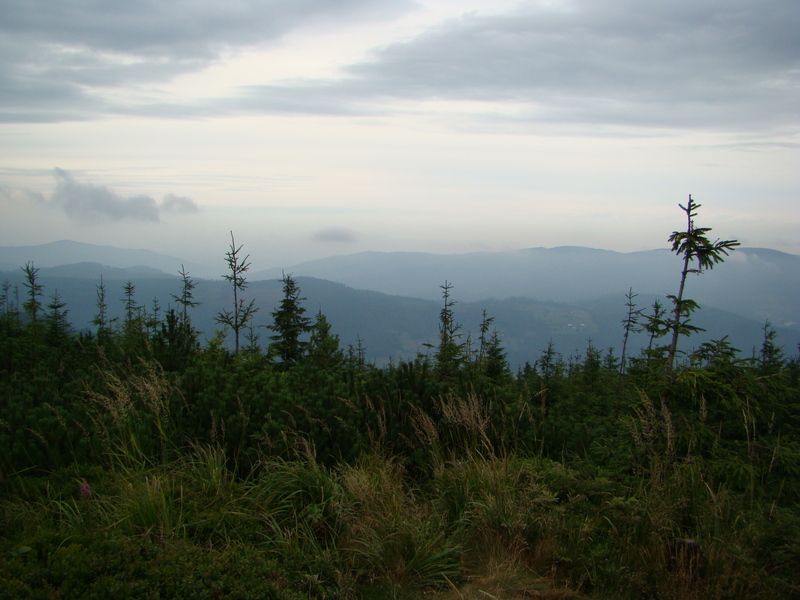 I was first time in Czech Republic! In the border we found sign between trees and Czech restaurant with unknown lables of products and food. 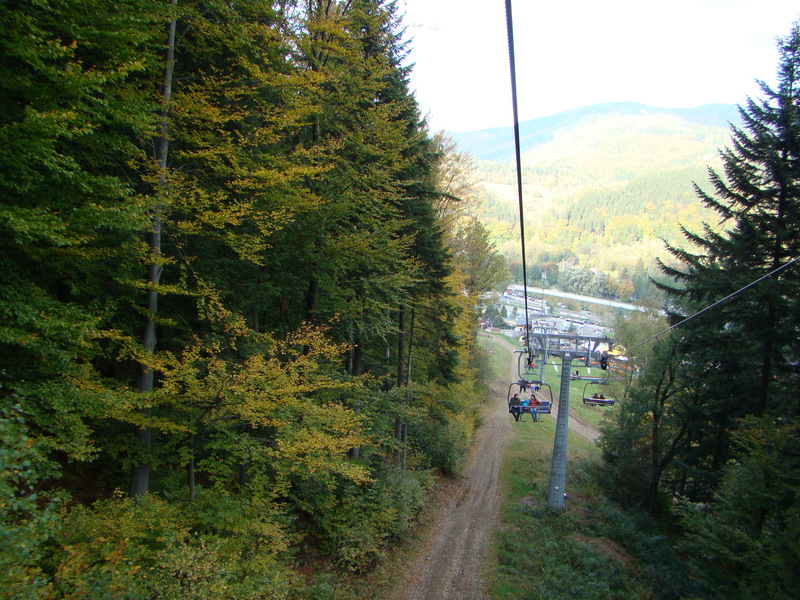 Szczyrk is quite famous Silesia ski resort. 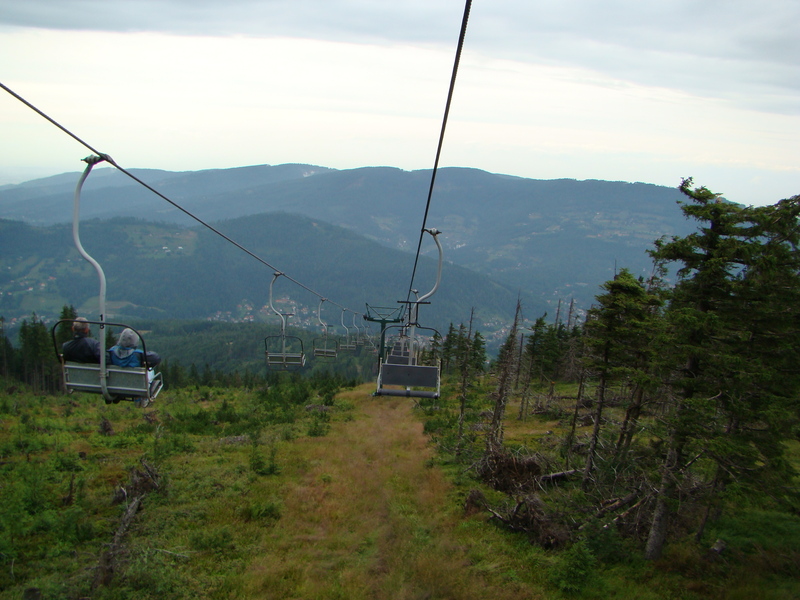 All ski resorts in summer time transform to hiking resorts. 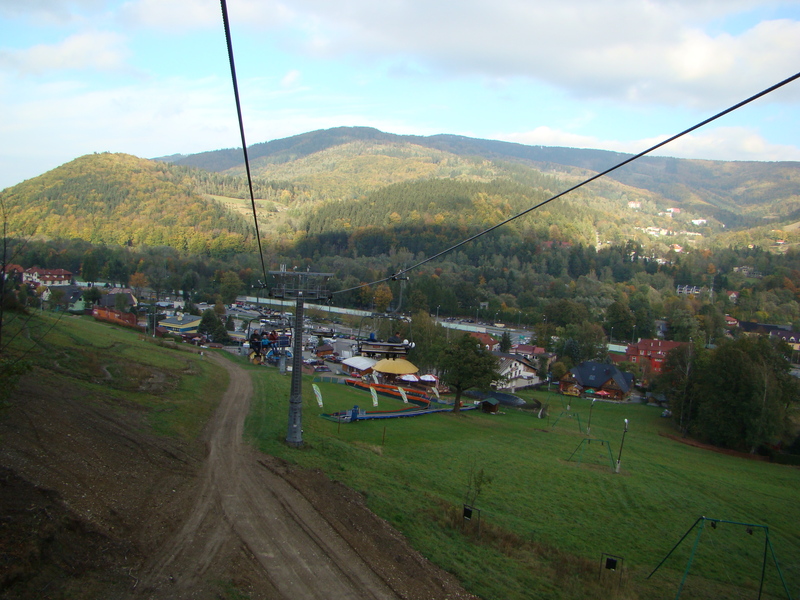 Szczyrk is situated in the Beskids (pol.Beskidy) mountains. 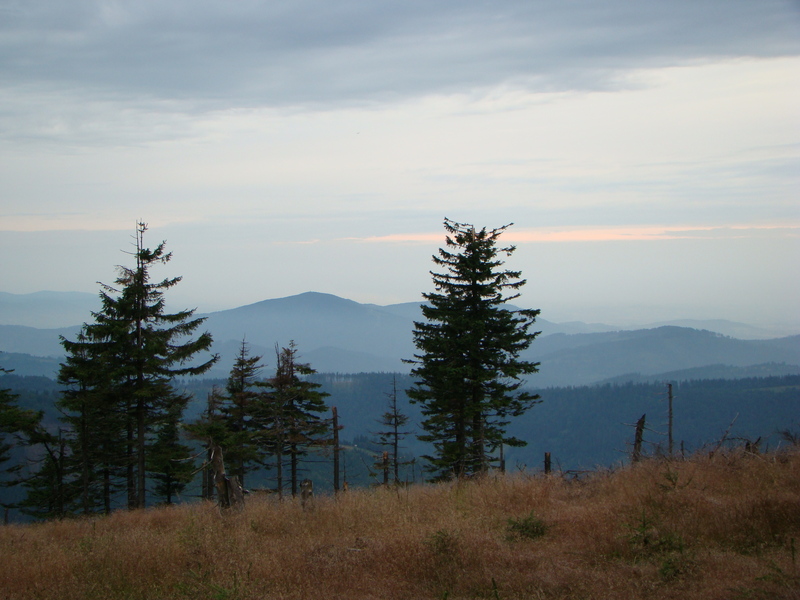 Beskids are stretching through Poland, Slovakia, Czech and Ukraine. 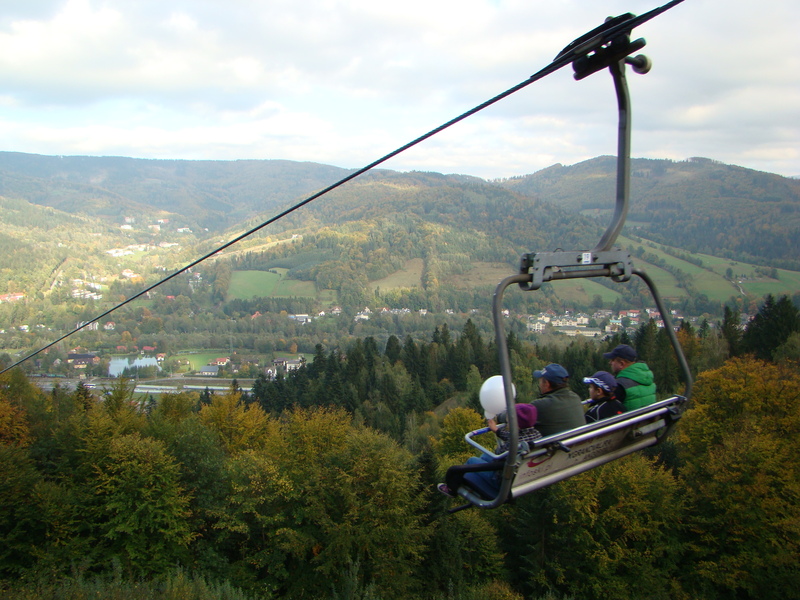 The best way to come to Szczyrk is first to come to Bielsko-Biala (pol. 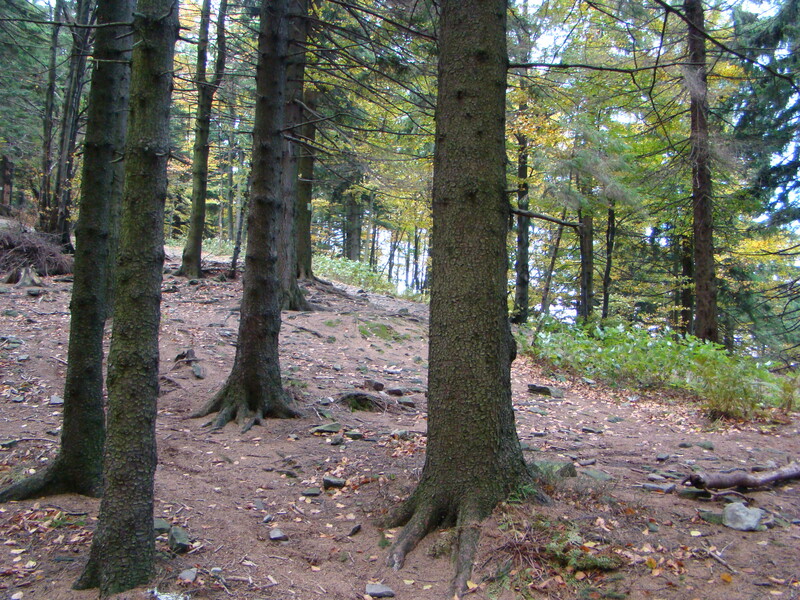 Bielsko-Biała). 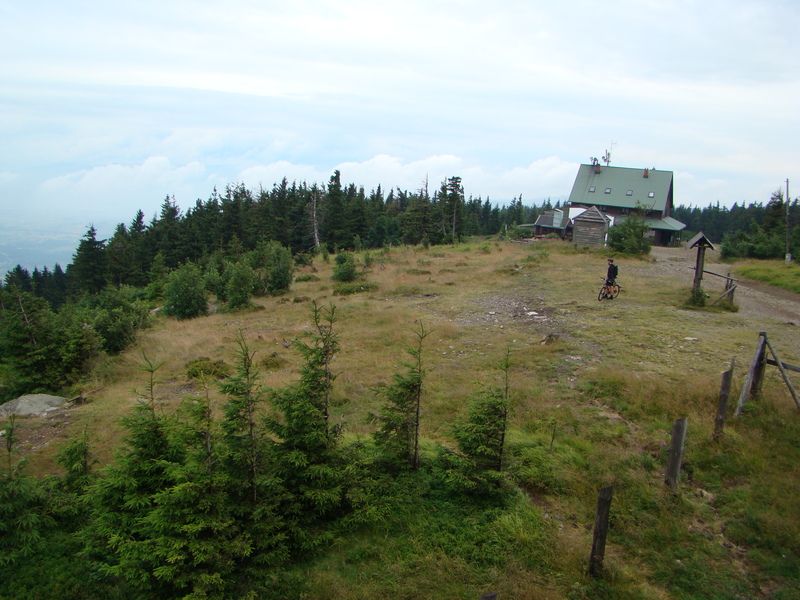 Szczyrk is near at hand from Bielsko. 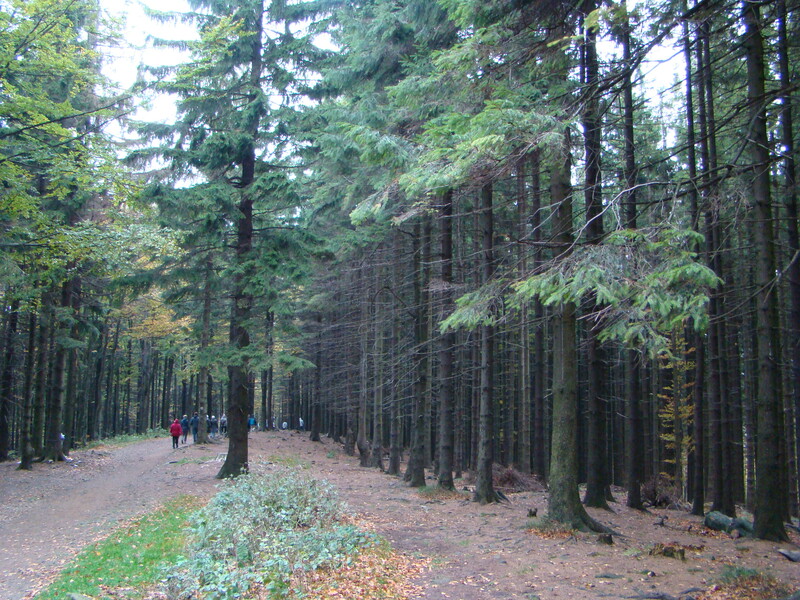 In village you can find thematical restaurants with Polish food, concerts of folk music, fair with traditional souvenirs. But we came here not for this. Mountains are waiting for us. 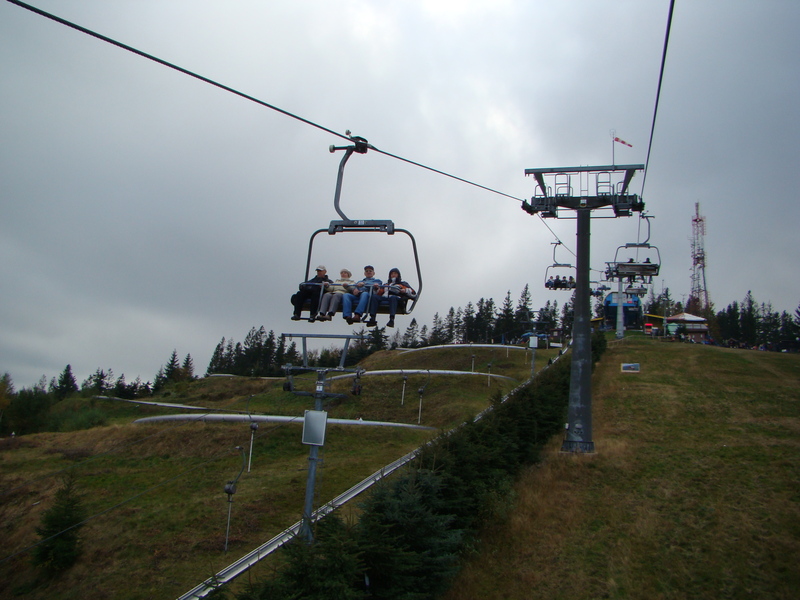 In Szczyrk take chair-lift to the mount Skrzyczne (price 12 PLN). Please, not forget to take warm clothes. Wind is blowing, and in the middle of July here was +14C. Riding a lift you observe perfect view to neighbourhood and feel flying. 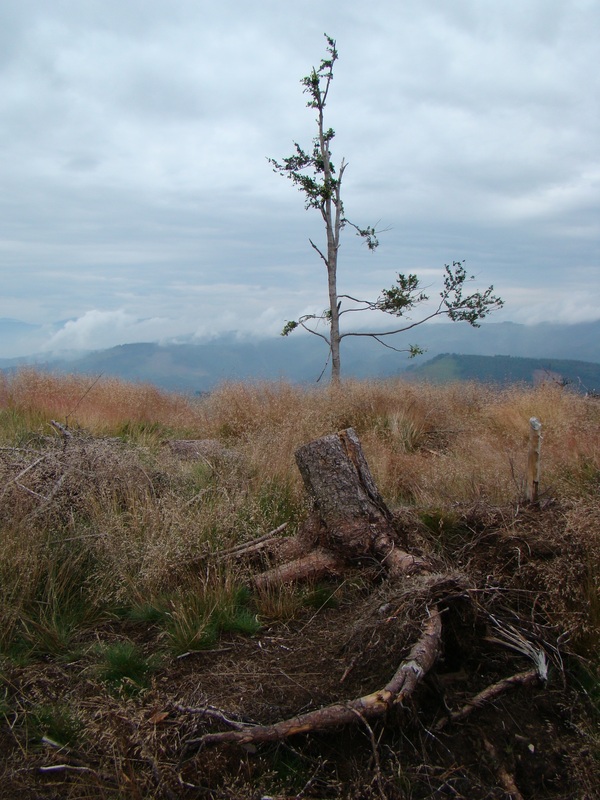 Under your legs you find stumps, fallen trees, green grass, around you – high firtrees. And breath! Air is fresh and clear here. Seems like you can drink the air. 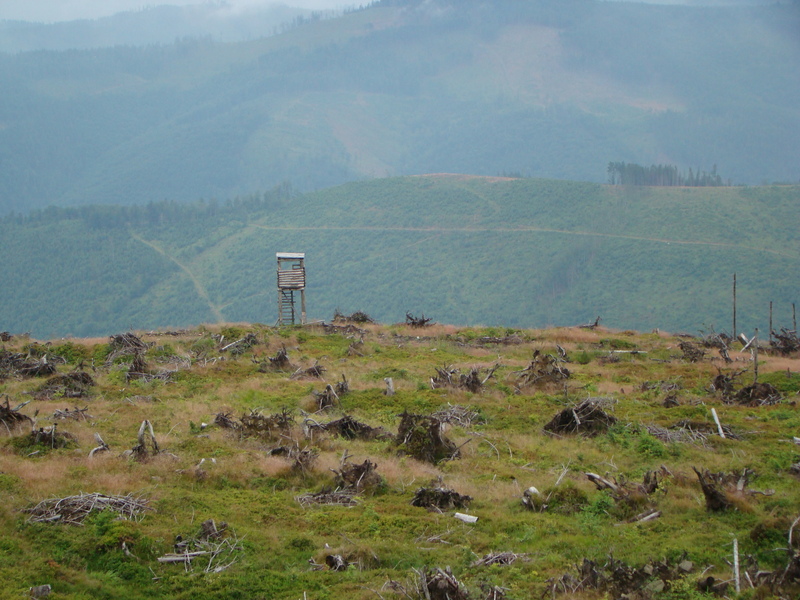 Lift drives you out of civilization, far far away. Leave all your problems below, and go to pure nature closer to sky. 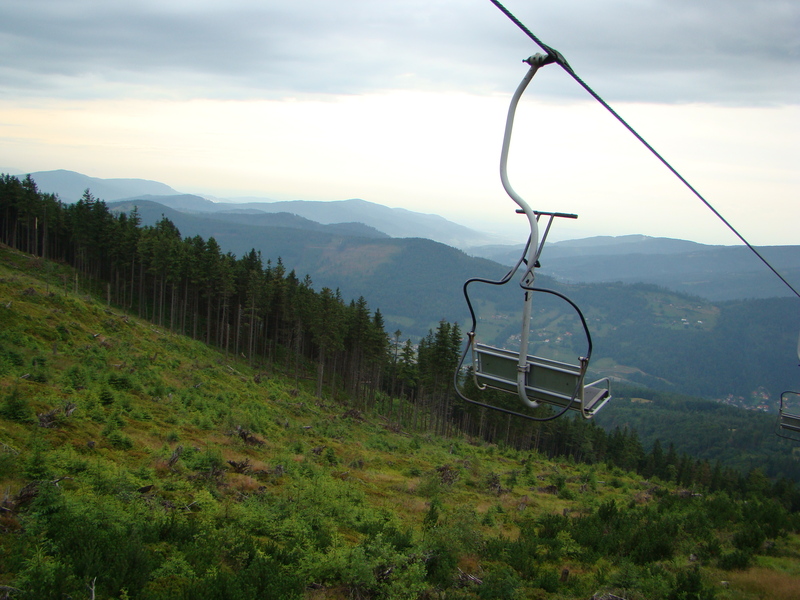 Getting off the lift you find charming beautiful landscapes. Green, grey and blue colors. From the top you start your way along one of several trails. 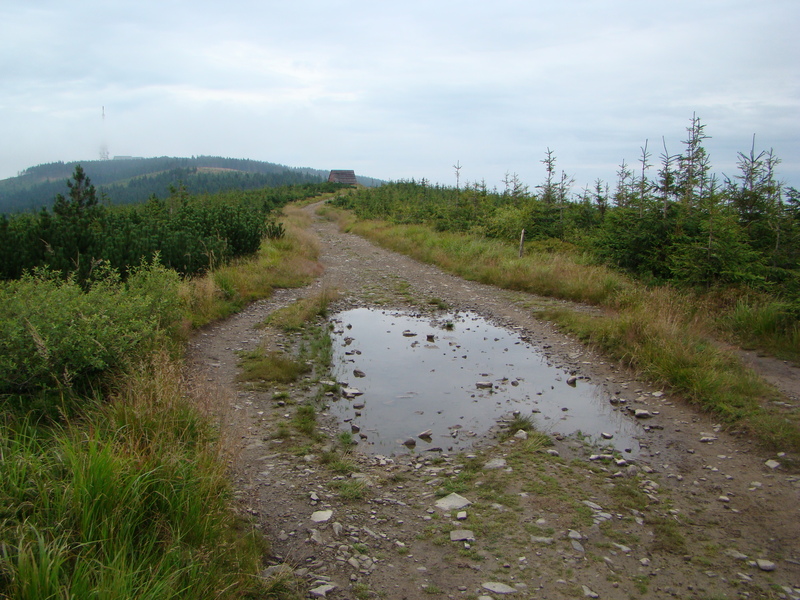 You can choose wide road, which is used for bicycles and ski, or tiny snaky track, where your legs will be scratched by blueberry bushes. 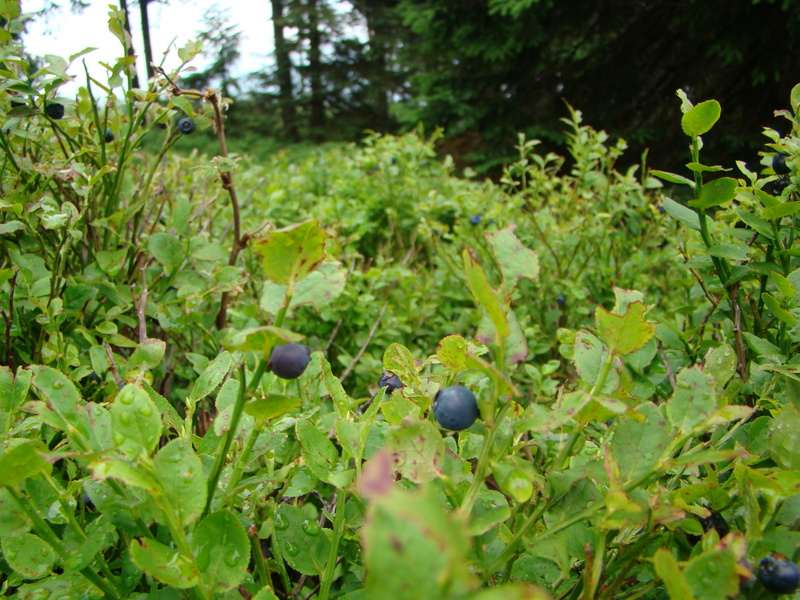 Blueberries are everywhere! Try this healthy and tasty berry – your fingers will be blue. Night comes here unexpectedly. Once you admire magnificent sunset, pick up healing herbals (lift stops work at 19:00), and next moment – darkness. So don’t forget to take with you to mountains a relaible person, who will not panic and search for the path to village together with you. Enjoy your trip. But I advice you to behave carefully and respectfully to nature here. 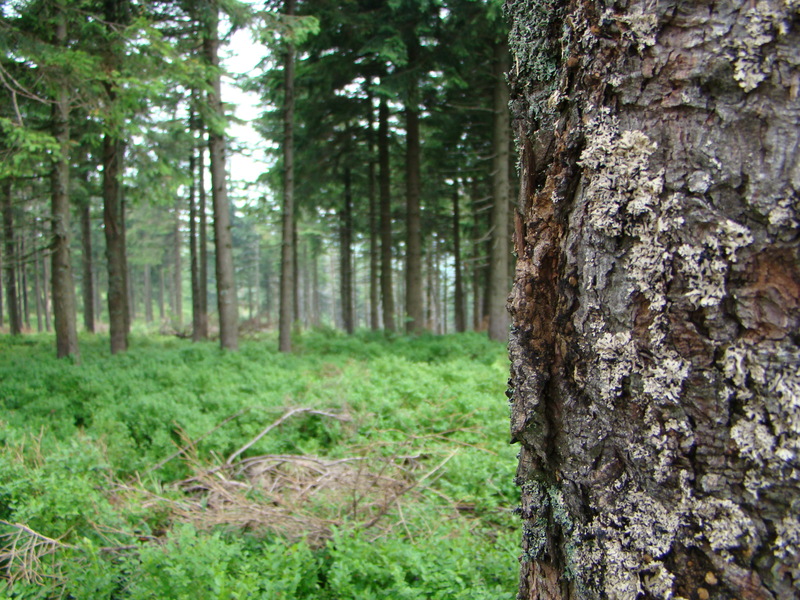 This forest is a mystery forest. Here gnomes and leprechauns are living. If you disturb them – they will get angry, send rain and storm to you. But being calm and kind-hearted they could play funny games with you, invite you to their houses and show forest treasures. Szczyrk is definitely a good choice for weekends. 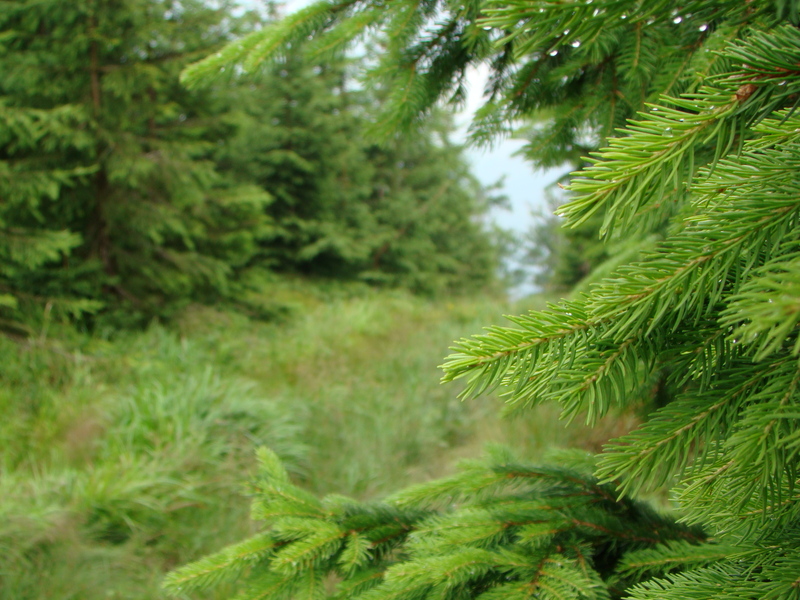 Before you can check web-site of Szczyrk – it looks useful.